Spring will soon be in the air. Easteris just about one month away. Yikes. 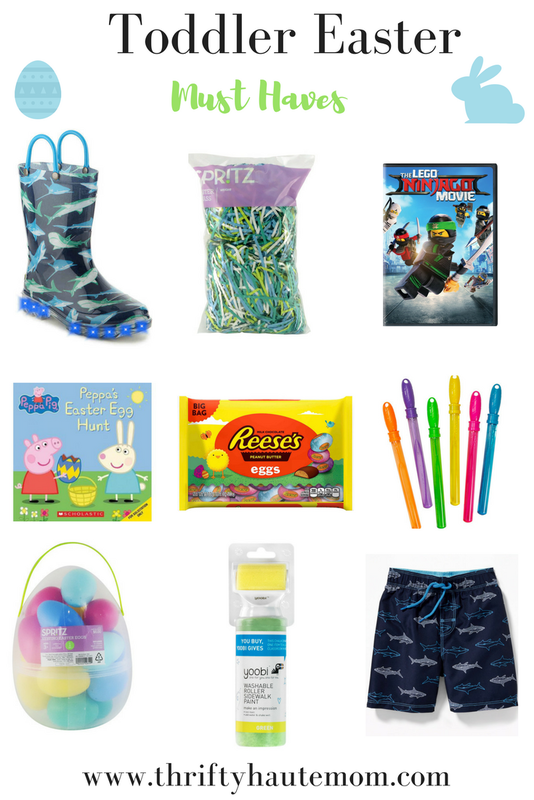 I decided this year we will have less candy and more non-candy items in A’s Easter basket. A more unconventional Easter basket. This post contains affiliate links and referral codes. You can click any image to shop. If you shop from my blog, I may be compensated for clicks or purchases that you make. Thank you for supporting me and this blog. Read my disclaimer page for more information. Instead of using an Easter basket we are opting for a Pinterest inspired basket. Using these shark rainboots as the basket. These actually light up so I’m sure any little boy would love these. Easter Grass is a must have when it comes to setting up for an Easter basket. We always end up getting way too much. Movies and holidays what else do kids ask for. Really!! We went to go see Lego Ninjago when it was in theatres and A loved it as well as me and my husband. It was literally the funniest action packed movie. Books are A’s favorite. We literally purchase 1 per month as well hit up our local library. He also loves Peppa Pig so this Easter book is perfect. Plus its paperback so you can bend it when placing it into the boots. We’ll only be adding a few pieces of candy. Since Reese’s are a favorite in our household getting a bag of these for his Easter basket is perfect. You can obviously purchase whatever kind. I also love Whopper Robin Eggs. What toddler doesn’t love bubbles? Plus these are under $1. Easter eggs are always the highlight Easter day. I love this because you have somewhere to actually store the eggs. If you want to go cheaper then I suggest grabbing THESE ones. They are from the same brand. Chalk is always fun in the Spring and Summer. Last Summer we experimented with spray chalk and A loved it. THIS one looks fun too. I’m sure the kiddos would love this. We always prepare for Summer during the Spring. A has started to lean off dinosaurs and started to become obsessed with sharks. THESE swim trunks are actually on sale right now from $8-$15. Hope these helped if you’re looking to use other than an Easter Basket and less or no candy. You can also swap the Resse’s with some other types of snacks if your littles are under 4 years. Happy Easter and I can’t wait to show my finished product.